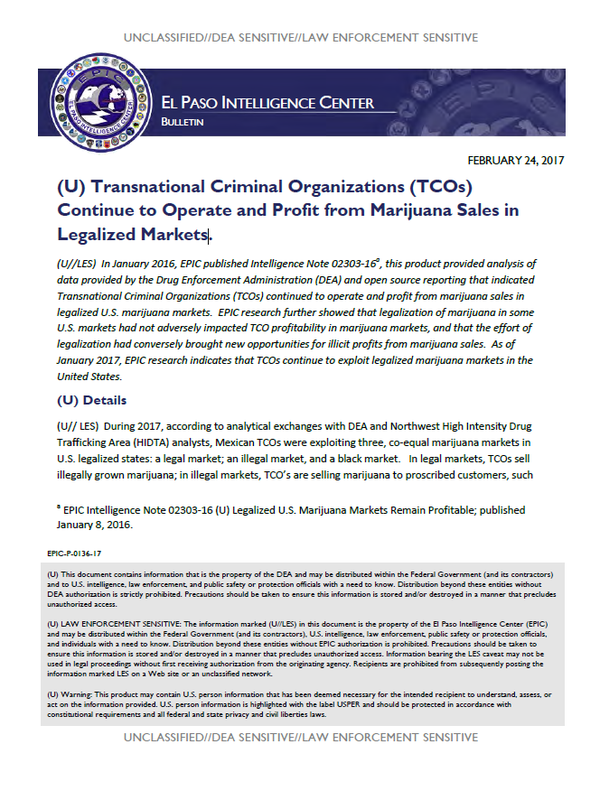 (U//LES) In January 2016, EPIC published Intelligence Note 02303-16a, this product provided analysis of data provided by the Drug Enforcement Administration (DEA) and open source reporting that indicated Transnational Criminal Organizations (TCOs) continued to operate and profit from marijuana sales in legalized U.S. marijuana markets. EPIC research further showed that legalization of marijuana in some U.S. markets had not adversely impacted TCO profitability in marijuana markets, and that the effort of legalization had conversely brought new opportunities for illicit profits from marijuana sales. As of January 2017, EPIC research indicates that TCOs continue to exploit legalized marijuana markets in the United States. (U// LES) During 2017, according to analytical exchanges with DEA and Northwest High Intensity Drug Trafficking Area (HIDTA) analysts, Mexican TCOs were exploiting three, co-equal marijuana markets in U.S. legalized states: a legal market; an illegal market, and a black market. In legal markets, TCOs sell illegally grown marijuana; in illegal markets, TCO’s are selling marijuana to proscribed customers, such as children; and in black markets, TCO’s sell marijuana at prices that undercut legally sold marijuana. In all three markets, TCO’s are evading state tax laws. TCOs are growing marijuana in legalized-market states on public lands and in green houses, and are reportedly transporting marijuana to non-legalized state markets. (U//DSEN) In November 2015, DEA reporting indicated that representatives of an unknown TCO were cultivating marijuana at indoor-grow houses in Colorado, and transferring marijuana to Florida, a state with strict medical marijuana requirements that ban recreational use. (U//DSEN) According federal and state law enforcement reporting, since the legalization of marijuana in Washington State in 2012, Washington State marijuana has been illegally diverted to forty-three states throughout the United States. (U) According to open sources, throughout 2016 federal agents and state law enforcement officers in Colorado have attempted to curtail illegally grown cannabis, and officials indicate that marijuana is being grown in the state for transfer and sale across the nation. (U//LES) Analysis of CY2015 seizure incidents on U.S. Interstate highways indicates Colorado State marijuana has been illegally diverted to states where marijuana is illegal . (U) In January 2017, according to press reporting, federal agents and authorities in El Paso County served several warrants and arrested several individuals in connection with an “out-of-state organization” for illegally growing marijuana outside Colorado Springs, Colorado, and illegally transporting and selling it in Texas, where sales are illegal. (U// LES) EPIC assesses with medium confidence, based on the developing nature of marijuana legalization within the U.S. that TCOs will likely continue to profit from marijuana sales in both legalized and still-illegal state markets. Decriminalized U.S. marijuana markets are still providing revenue flows to TCOs, and investigative research data continues to strongly suggest that rising marijuana demand will continue to encourage TCOs to meet that demand.